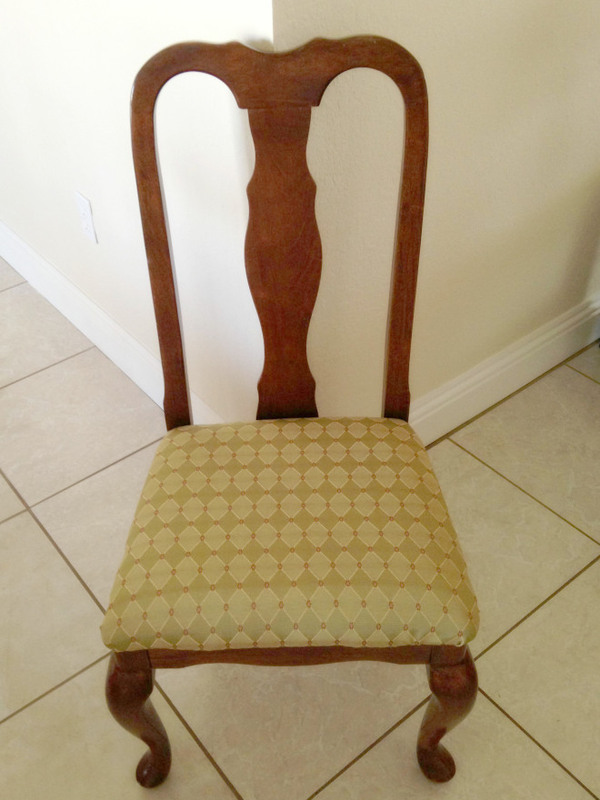 Then I realized that I could use a chair I sit in every single day – my dining room chair! 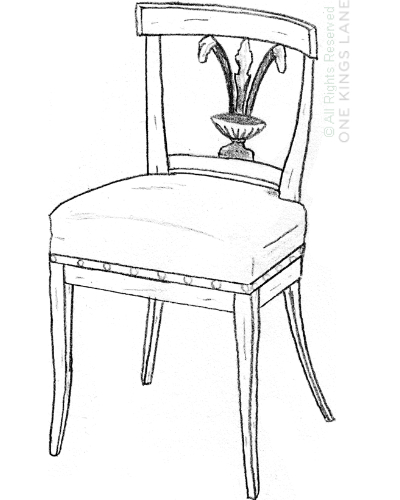 I just figured these were “dining room chairs” but, when I logged on to One Kings Lane’s Home Decor Resource Guide, I discovered something: my chairs are very close to being Biedermeier-Style Chairs! What is so neat about the Home Decor Resource Guide is that you can browse by furniture category (things like chairs, sofas, desks, etc.) or by time period (for all you antique furniture fans!) It really is pretty cool how the pieces you have in your home have their own story to tell! While I was looking around, I came across a really neat article called The History of Rocking Chairs, which, of course, I read, with the rocking chair I have in our guest room in mind! So interesting! If you’ve heard of One Kings Lane, you know they have fantastic high-quality furniture for your home. But with the Home Decor Resource Guide, now they’re so much more! Check them out and see what you can find out about YOUR furniture! This entry was posted in DIY Project, Home Decor and tagged Furniture, Guide, home decor, Home Decor Resource Guide, One Kings Lane, Resource, Statement Chair. Bookmark the permalink. I love One Kings Lane! I started shopping with them a little over 2 years. I’ve actually started rehabilitating and refurnishing old furniture I find for free and a statement chair is next on my list! Ah, a fellow One Kings Lane lover! Awesome! Good luck with all your projects! I have never heard of One Kings Lane, but I sure do need to check them out. I need to fin a match for chairs I have in my Dining Room. Going to check and see if One Kings Lane has anything close. Yes, do check! I’d love to hear what you think of them! Whether new or recovering an old one, they are both beautiful. Love small touches that add a whole new look to a room. I like that first chair! I need new chairs in my kitchen badly! I wish I had more room for chairs in my living room. Me too! We only have a couch and a love seat, as well as a couple of “sitable” ottomans in our living room! I have One King’s Lane app on my phone! I don’t think I’ve ordered anything yet, but I do love browsing. They have some fantastic items! I have heard of One King’s lane, but haven’t had the chance to go shopping with them yet. I love their selections though. Great chair options. I like the first one best. Please do, Carla! Hope you enjoy! I’ve never heard of one king lane before but that chair is gorgeous I will have to check it out! You should! They have beautiful pieces! I don’t have a statement piece, but I’ve actually been considering something with a zebra or leppoard print! I really like that colorful one – very cheerful! This makes me really curious about an old chair I got passed to me from my grandfather. I have shopped at One Kings Lane online before. But it was a couple years ago. I think maybe it was dishes of some kind? Yep, they do have those! I haven’t shopped there before. Looks like an amazing site, though! I love the chair seat coverings; they’re very pretty! I love that first chair, it’s so much fun! I need to check out One Kings Lane more often. You might get addicted 🙂 In the best way possible, of course! Yes, lots of fun to browse their things! That sounds like a great resource. I want that floral chair! That chair rocks! I am so getting some statement chairs soon, I get their email everyday maybe I should open it! Thanks for the reminder. Have a great weekend! HA! You should totally open it! I love this chair! I have been looking for statement chairs for a while now. I will have to check out their products. You will love what they have to offer, Pam! Love this. Looks good. Never heard of them but.. such lovely design too. I like the floral design. The resource guide totally rocks! It is part of the treasure hunt to find out the origin of styles (or anything). I have been fascinated with the adds of One Kings Lane, but have yet to purchase anything. They are a great source of inspiration. I have always wanted a statement chair somewhere in my house. We are going to be redoing our bedroom, and I think that would probably be the best place for one. Oh yes! I’ve been wanting to put one in our room for a while. A good place for sitting to put on shoes, etc.! I have never heard of One Kings Lane, I need to check them out as we are moving into a new house tomorrow which means new rooms to furnish. 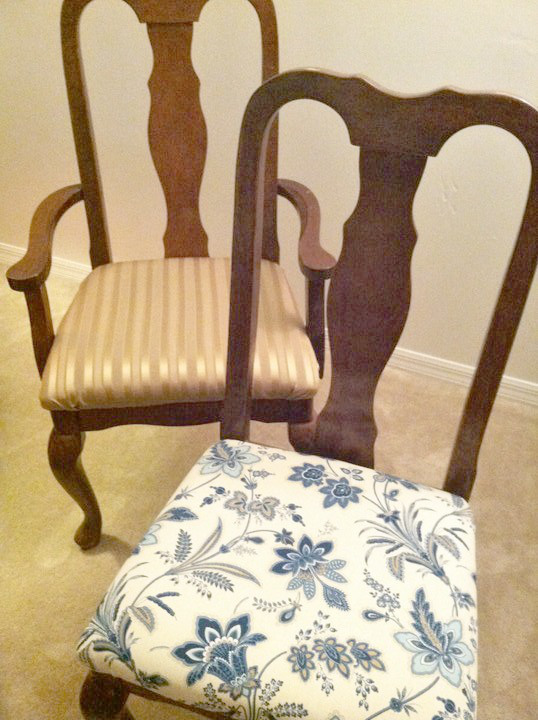 I love your dining room chairs, you did a great job re-doing them and they do make a great statement chair. I’ve seen One King’s Lane advertised on various blogs, but I had never actually gone to the website. I really like the way you explain it. Thanks! I’ll have to take a look. I want to do some freshening up around here! And spring is a great time for that! I don’t have a statement piece in the house just yet. Maybe when the kids get older. i do like the idea of refinishing rather than just buying new, especially if you want to make a new “statement” – it can easily be done with up-cycling! I’ve always wanted a chair that was too funky to be furniture, so when people come in they don’t know whether to leave their jackets on it, or sit in it. You did a fantastic job on that chair! HA! That WOULD be fun! O.K., so I was in love with that chair in “Revenge” the one that had wine tossed on it last season.. I had a beautiful script print all over it, that’s my style of statement chair. I love colorful, but not in my décor.. my husband almost cries when I put bright in the house. There are so many great neutral Statement chairs too and I love the dining room chair ideas! Several years back I covered our dining room chair seats with a leopard print towel.. yes, I said towel. I love texture too, so terry cloth having two sides allowed me to do the chairs very similar but with a slightly different texture using the same set of towels (on super cheap sale of course). I don’t think I’ve ever shopped or browsed One Kings Lane, but going to click on your link and check them out.. sheesh.. they will probably end up on my favorites tab! I KNOW!!! I loved that chair on Revenge!!! And I love your idea for covering chairs with towels, especially a dining or kitchen chair! So creative! Well, from the looks of thing I need to check out One King Chair. I have never heard of them. Looks like they have great pieces. They do have beautiful things! 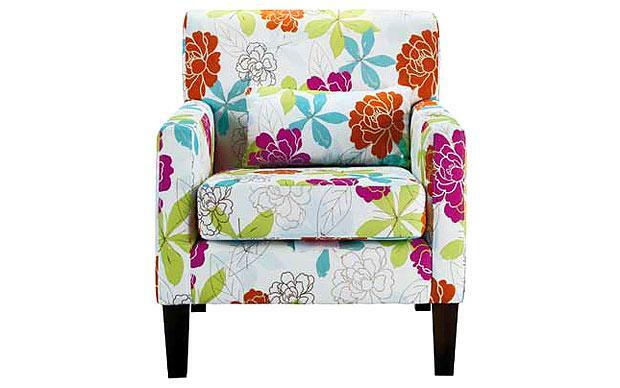 The flowered chair looks really nice and I would love to have it in my house. It’s important to have a comfy chair to sit in when one gets home from work. That is true! Although when I sit down, it’s over LOL I try to stay up as long as possible when I get home! I never heard of this place but it sounds amazing! I love that chair! It IS amazing! I need to find one of their locations…I’ve only shopped with them online! I love to learn about where my furniture came from and furniture history, in general. This site looks interesting. It is very interesting! A nice touch for them, for sure! Okay, I think I need One Kings Lane in my life! I’ll soon start redecorating and I need all the help I can get. I no longer have a statement chair since moving to my new home but it’s on the list! Your life will be more complete with them in it LOL Enjoy your decorating journey! I love One Kings Lane! I first found out about them on one of those reality decorating shows … I think it was Million Dollar Decorators or something like that! Love them! I would LOVE a statement chair for my house! Right now all we have is my husband’s ugly recliner that I have taken over! Haha!